The following article was contributed by Hosffman Ospino, PhD, Director of Graduate Programs in Hispanic Ministry at Boston College – School of Theology and Ministry. Heath and Harry were inspired to create Bennett Brothers Balm when their friend Timmy was diagnosed with Hodgkin’s Lymphoma in May 2016. They wanted to raise money for cancer research and to create a product that would help his skin feel better after the chemo treatments. The entire idea and promotion of the balm lotion was Heath and Harry’s. Their mom and dad helped with the stirring of the ingredients and supervising the pouring of hot liquids. The lip and body balm is a popular local and online seller and 100% of the proceeds go to cancer research. 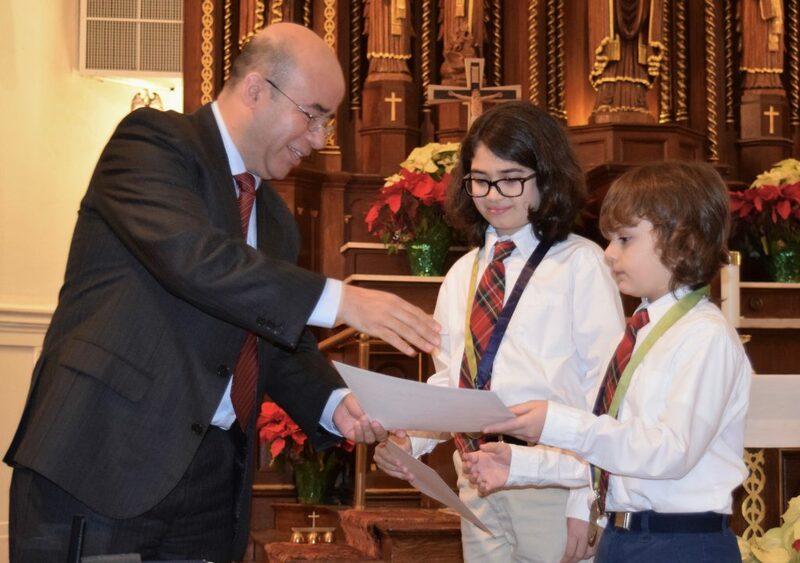 Dr. Hosffman Ospino, NCEA Board of Directors member, presented the NCEA Youth Virtues, Valor, Vision Award to the brothers Heath and Harry Bennett. It was a beautiful celebration that began with the Eucharistic celebration. The entire St. Joseph School community was present for the conferral of the award. I was honored to meet the Bennett brothers and their parents as well as the teachers and staff who have created a great environment for Catholic values to become life in ways that are truly life-giving. Mayor Burke of Medford, MA was present along with Timmy Corcoran and his family. In her brief remarks she highlighted the importance of the school and the example of the two brothers to the construction of a better society. There is no doubt that this award is an affirmation of the incredible value of Catholic education. At the same time, the award is a way to inspire the students who attend our Catholic schools to truly be women and men for others —as my Jesuit colleagues regularly say. At the more personal level, the experience was profoundly enriching. In the short time I shared with the St. Joseph School community, I was drawn into what I would call a sacramental moment. There is no doubt that God was present, especially in the celebration of the Eucharist and the proclamation of the Word. Celebrating our faith together set the tone. But God was also present in the little actions that revealed the love the teachers have for their students, the sense of pride of young and old at witnessing two of its members being lifted for embodying the best of their shared convictions, and the hope that only the looks and smiles drawn on the face of children can inspire. This experience reminded me of the Catholic school that my children attend and the reasons for which I would choose Catholic education again and again. The visit has motivated me to continue to advocate to make sure that as many as possible school-age Catholics, almost two thirds Hispanic, are educated in our Catholic schools. 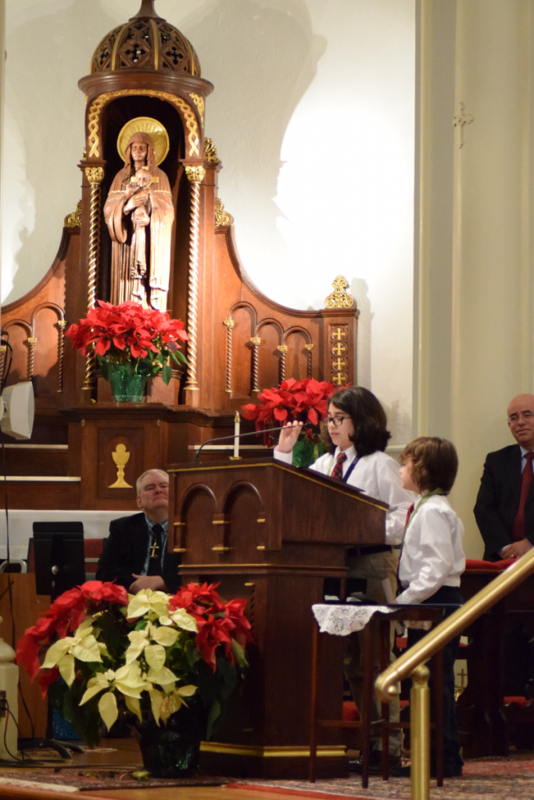 I can easily see many of the 8 million school-age Hispanic Catholics in the country at this point in history being lifted like the Bennett brothers for bringing their faith to life with the support of an entire school community that shares their values. They just need to opportunity to do that.